I've been busy in my sewing studio today working on a little project for next Christmas. I know it's kind of mean; I can't show it all because I'm not sure where it's going yet. And since I'm not getting anything else done, I'm showing you a peak. 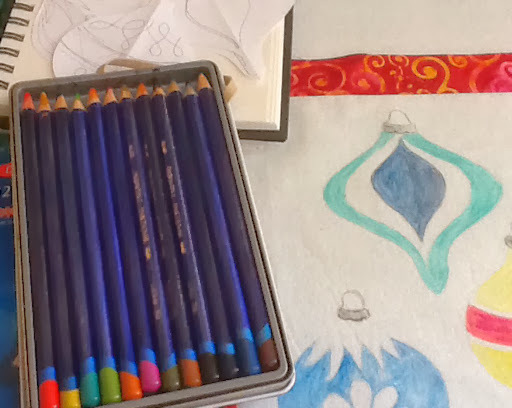 I've drawn up designs inspired by vintage ornaments and used Inktense pencils to color them. I should get it finished in a few days and then I'll get back to the shanties. Tomorrow, I'm going out for lunch and then Saturday is a guild UFO day where I will work on the quilt I started at retreat. I'm quite the gadabout aren't I? 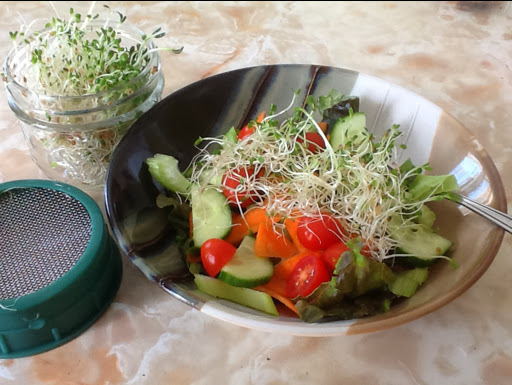 Has anyone tried growing your own sprouts? I've started just this year and I have to say, it is rewarding in the middle of winter to grow something for your salad. 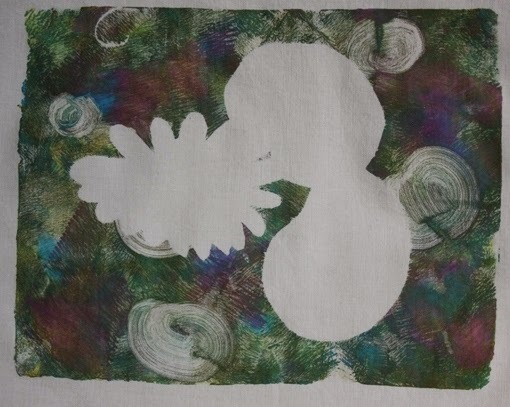 A quilting friend has been asking me to do a workshop on printing with the Gelli, and since I haven't gotten around to it, I asked her over today to work with her. We first had a cup of tea and muffins while we perused a book of flowers and talked about colors. 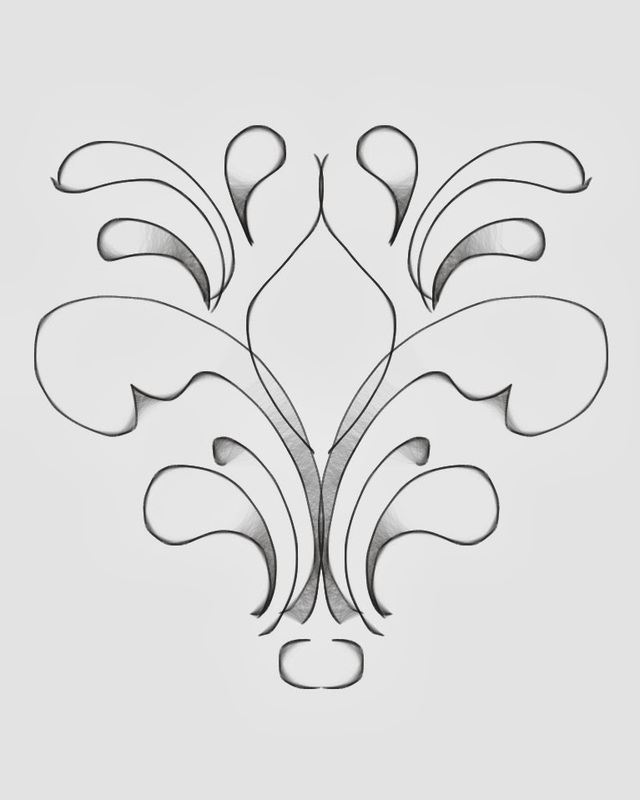 We drew up a few shapes on paper and cut them out. 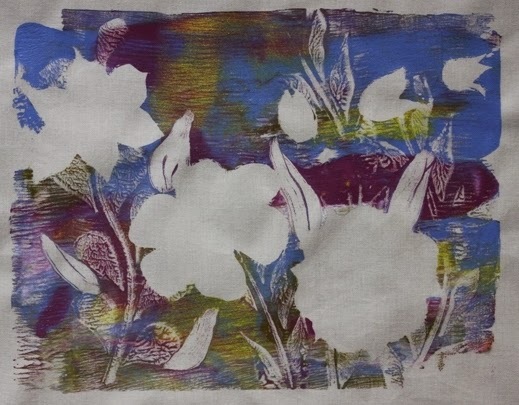 These are used as a mask on the Gelli plate once the paint is rolled onto it. I didn't even think about pictures during the process. The second one came out a lot lighter. It is a bit more pastel than it shows. For some reason the turquoise comes through a lot more garishly than in real life. I tried photographing it in 3 different rooms. Carmel really likes water lilies so we tried one. I showed her how to use the Neocolor II crayons to add some color. She took the prints home with her to try adding the details with stitching. 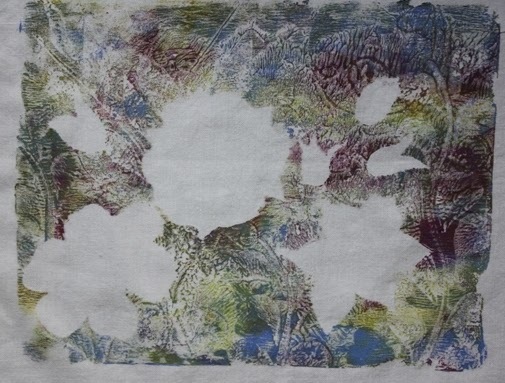 Her plan is to use one of her prints to make a sewing machine cover. 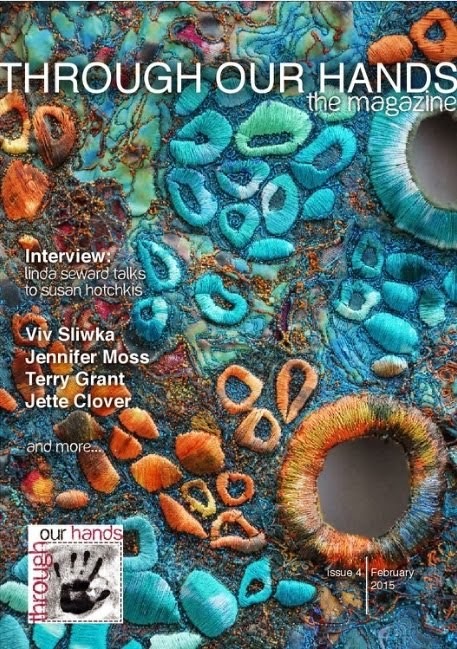 I'm connecting to The Needle and Thread Network. If you know me, you know that I like to get my housework done on Mondays so I can then forget about it for the week. As usual, this morning, I got did some wash, and then vacuumed and damp mopped a hardwood floor. I've got a quilting friend coming tomorrow for a bit of fabric printing fun and, really, my place needed some serious cleaning! This afternoon, I finished up sewing the 2 pillow shams for my sister in law. 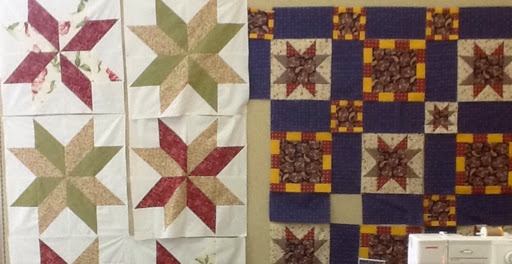 I rather like the randomness of the piecing that I did using the scraps from her quilt. 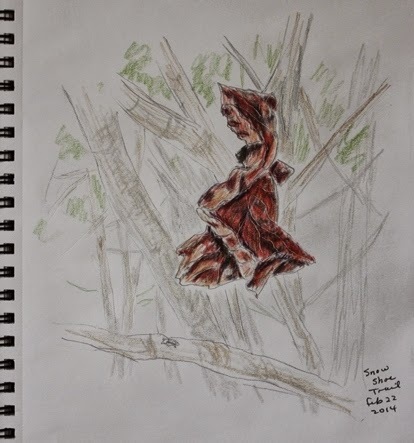 I did this sketch of the dried leaf that I pictured yesterday, taken while snow shoeing. I like it's texture and color and the way it stood out against the softly colored background. I'm wondering if I could translate that onto fabric. I'm thinking about it. I've got a bit left to do on my 2nd fish shanty piece, and at the same time thinking about how i might approach the leaf. 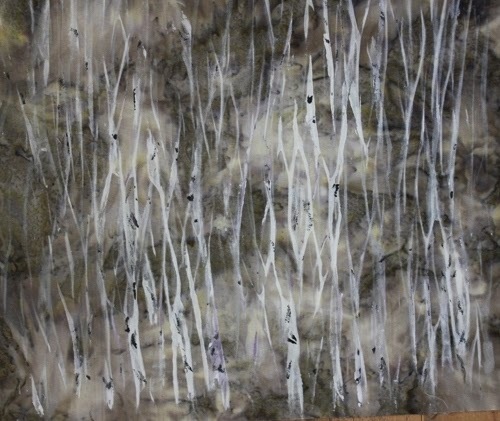 One thing I'm considering is using one of my shibori painted pieces from my Quilting Arts article last year as a background for a foreground tree with the leaf. 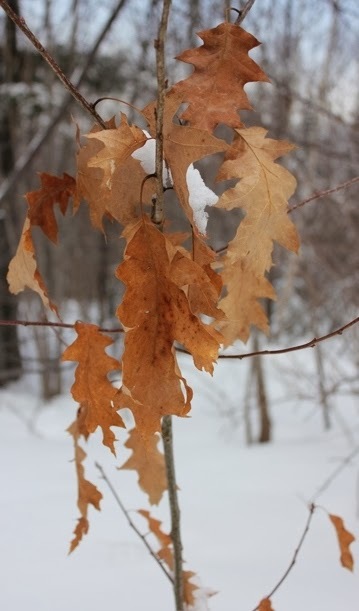 I would raw edge applique the tree and the leaf. We are having spring like weather this weekend. It is amazing! We went snow shoeing this morning and wore only a single layer fleece top. The only slightly uncomfortable thing was that the snow and ice was melting and dripping onto us from the trees. Most of the trail is in the woods so we got a bit wet. a little screaming was heard when a clump of snow went down my inside my sweater! I forgot the camera , but Gord took this photo for me with his cell phone. 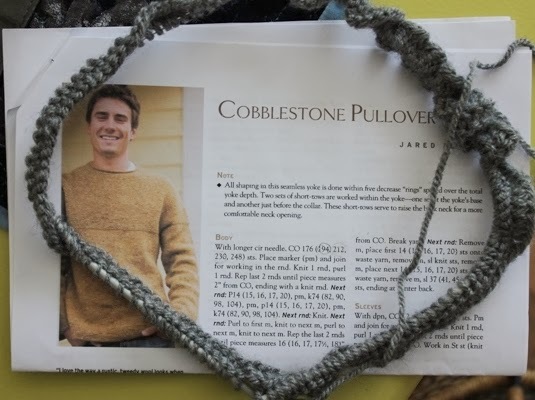 I might jsut have to try it in fiber. After lunch, Gord went out to his 'driving range' while I came into my sewing room. This was my view. I had to suppress a few giggles. 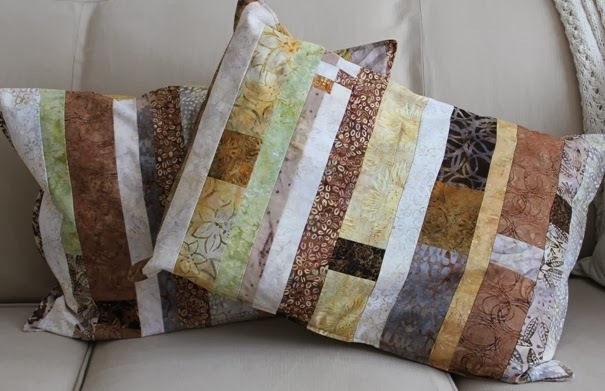 While I had my machine switched back to straight sewing, I thought I'd put together the batik pillow shams that I'm making for my sister-in-law who I made the quilt for last year. It's a bit big so I will make a larger seam and probably top-stitch a bit of a flange. That should do it. Also, I have regular sized pillows. I should check what size she'd like first. Have a great weekend! I hope your weather is as beautiful wherever you live in the world! I went out early this morning to shovel following about 6 inches of light fluffy snow that fell through the night and then walked to the coffee shop to meet friends. 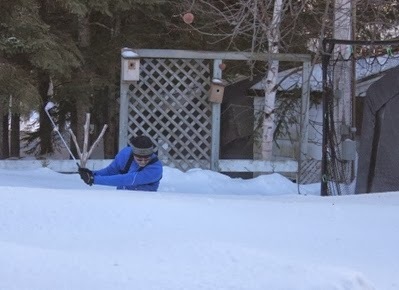 I came home and did a bit more shoveling. Then I had time for a bit of stitching before lunch. I brought up the women's figure skating on my I Pad after lunch and went back into my sewing room. The free skates were so beautiful. I think everyone expected the Korean skater to win gold, especially after her skate. It was really breath taking. However, they marked her low allowing the Russian skater who they seemed to have over marked to win gold. Oh well, that is figure skating. It was lovely to watch anyway and there was certainly joy in the Russian arena. I managed to keep my eyes on my sewing enough to get more details added to my Shanties and to add the border. Now the big decision is what kind of batting I should add. I've opted to do most of the stitching with a couple of layers of stiff interfacing. With the batting added, I will add some outlines and a few simple details, enough to anchor the top to the back. I don't plan to add anymore to the sky or ice as I want to keep it flat. I really wanted to watch the last few performances of the figure skating so I sat down with my knitting-- a men's sweater that I had just cast on. It's been years since I've tried a sweater. I wanted to try something with wool in it for my husband. You probably haven't noticed but increasingly, I've had trouble to keep up my sewing and blogging pace, feeling extremely tired of late. I got word yesterday that I have mild sleep apnea which didn't please me. I have enough ailments to contend with. Anyway we kept thinking the fatigue was related to my Addison's and hypothyroidism but it turns out not to be. I've been reading up on it a bit and although the C PAP machine was recommended by the doctor who read the test, I will wait for an opinion from my ENT specialist who has seen me for years and done a few nasal polyp operations on me. Also there is the issue of my weight which my doctor has told me not to fight against because of my health issues but I really must do something. A loss of 20-30lbs might help so I will redouble my efforts. I've always been a faithful exerciser but now I really need to restrict the calories and particularly watch the desserts. I love those too much! It's an absolutely beautiful sparkling winter's day today! My husband and I had doctor's appointments this morning after which I went outside and cleaned up the front and back walks a bit more after the Sunday storm. I went for a short walk really enjoying the sun on my face. Then, I had lunch with a friend and we went and did a little dreaming at the furniture store. We have quite a small bungalow. At least we won't need to downsize, but we do need to do some cleaning out. My husband has been slowly painting the kitchen cupboards. They were oak but old, once refinished already and really in need of an update. So we've painted and what a difference. We're planning to add the door to the large corner cupboard on the left but thinking of leaving the doors off both sides on the overhang to the right. I've cleaned out lots of junk and added some pottery, jars and the dishes there. i really like how it lets the light shine through. My shanties are progressing slowly. there are lots of layers of stitching and still more to come. 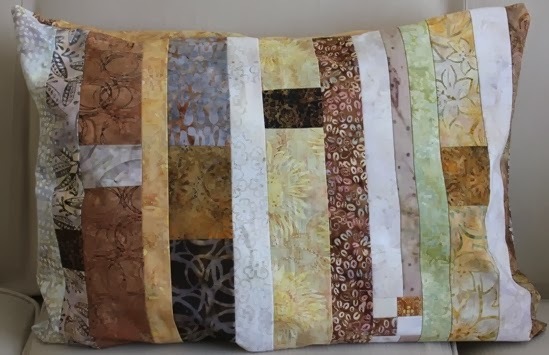 If I don't have the exact thread color that I want i will use a couple and let them blend together. In a session, iIgradually work my way around the piece adding bits here and there. I've a few more details here and there to add and then I will border it and back it and add a bit more. 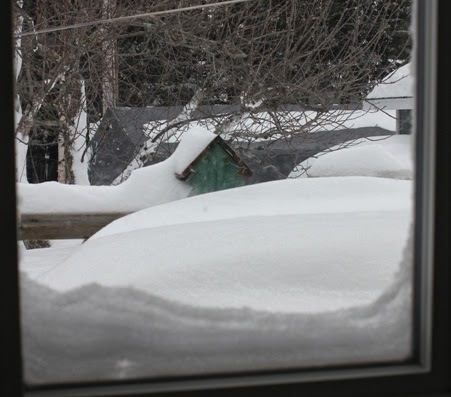 Here in Northern New Brunswick it's been another stay at home day while the wind and snow blew and swirled about outside. I haven't checked the weather stats for total snowfall yet, but it's the second 'doozie' of a storm in 3 days. 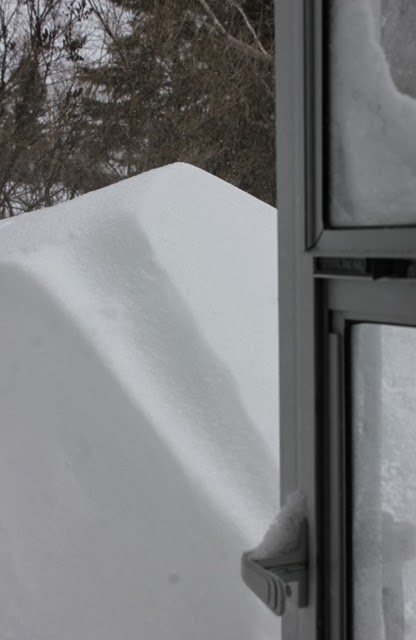 Our deck drift is huge, the back door was drifted in and the car was nearly covered. The deck through the kitchen window. I went out and got my exercise by clearing off our front walk which cannot be reached with the snow blower. At least it was a bit more powdery today and I was able to push a lot of it into the driveway where my husband could blow it. The banks are getting pretty high--too high to blow the snow atop it in some places. Ah well, it won't be long and it'll be melting, won't it? 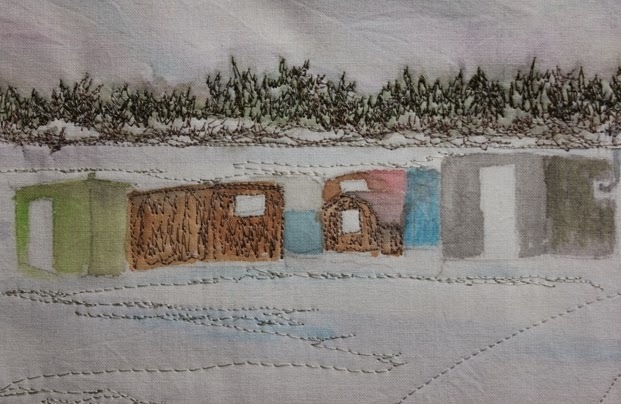 Earlier today, I used the Sochi App for my I Pad and watched the figure skating (dance short program) while I did a bit of stitching on the Shanties 2. I will show you my progress as I go along and you will see how I build up the layers here and there. I'm starting to build up the colors on the shanties. I am planning to go back into the window areas with some painted shading as well. 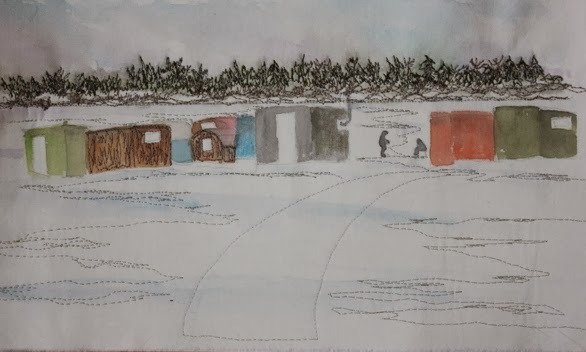 I will do most of the stitching on the shanties, the ice and sky before I add borders and a batting. When I add the batting, I will stitch a few lines only here and there. I always resize my photos to make them easier to load but I think you'll still be able to see the areas that are stitched so far. Well, I'm pretty well beat now, so I'm taking my tea out to my big comfy chair for a short rest before dinner. We had so much snow today, that my husband couldn't get to work. With an all wheel drive that's pretty rare. front walk while Gord tackled the driveway. I was out for an hour; he was out for two. This morning, I played around with my I Pad experimenting with mosaics. I didn't go into my sewing room because I wanted to watch the Olympic men's figure skating finals. It wasn't super exciting but Canada's Patrick Chan did win the silver. He was a bit disappointed in his skate but I was happy with the silver. The rest of the day I played around with a mirror image drawing feature on the Sketch Club App that I recently got on the I Pad. And then I just kept doodling, saving dozens of them. 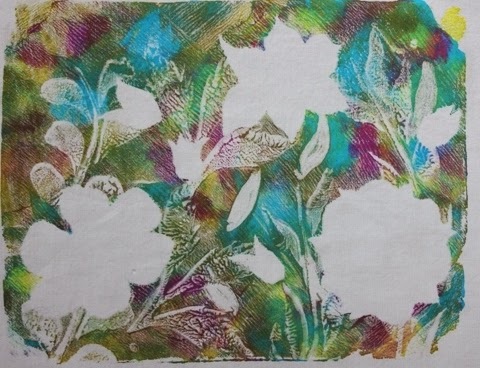 They would be great for quilting, stamping, stenciling or screen printing. I hope you're staying warm, cozy and safe if you're in a storm area. 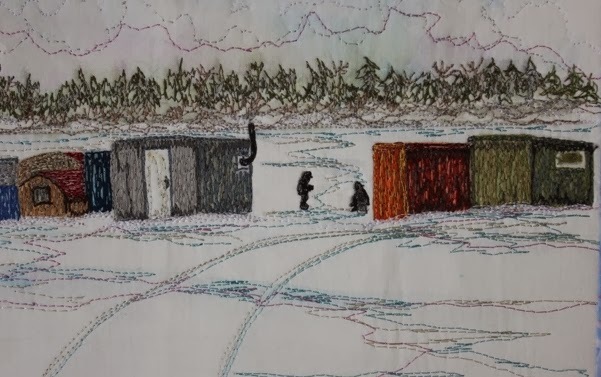 When I did a show and tell of my first fish shacks piece at the retreat last weekend someone said, "Oh, the shanties". I had forgotten about that name and I like it much better than shacks. It sounds cozier and cuter somehow. 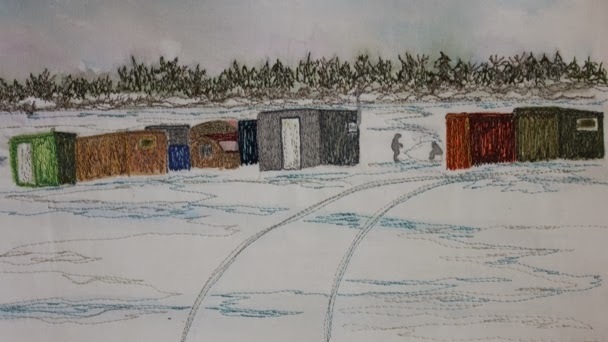 Today, before and after lunch, I started laying in some preliminary stitching on Fish Shanties 2. I was getting into it but I had to stop to get out for my walk. You will, as usual, be seeing some of my process pictures as I add a little here and there daily. I'm just getting started. I did add a second layer of the heavy interfacing this time and it is much smoother. When I get the shanties mostly stitched, i will then add borders and batting of some sort and finish up more of the stitching. I also couldn't resist taking more photos of my backyard birds. I took a bunch of the goldfinches in the branches of my apple tree for future reference. There just aren't enough hours to do all the pieces I'd like to do! 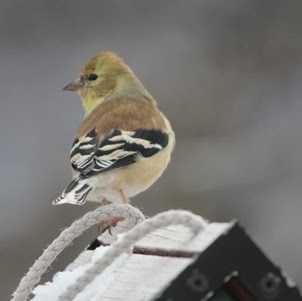 This one of the finch on the feeder came out with nice detail. I like it's slightly coy demeanor. It's looking like we're going to get a rather serious nor'easter tomorrow. Some things have been already cancelled including a Valentine luncheon rescheduled for Saturday. It looks like instead of having an errand day, I'll be home doing some more stitching. Yesterday, after retreat, I spent most of my day unpacking, cleaning, washing clothes and making soup and bread. I got my sewing space set to rights and ready for some thread painting today on my second fish shack piece. I've sold the first one by the way and the second one is spoken for. I could even sell a third one if I'm inspired! However, by last night I was exhausted and also sniffling and sneezing which went on through the night. It's nothing serious but because of my Addison's, I'm resting up. 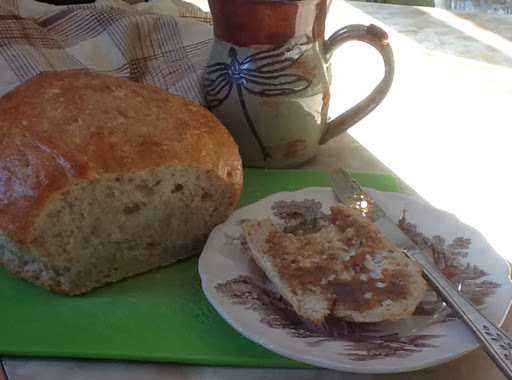 I've had a few cups of tea and just had to have a fresh heel of bread with molasses, an old favourite from my childhood. 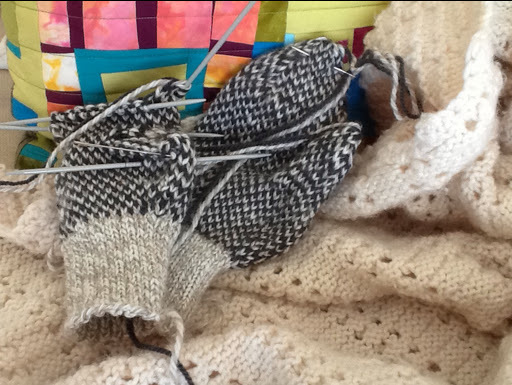 I've been watching a bit if the Olympics opening ceremonies which my husband recorded for me and knitting. Well I'm home from my 3 night, 4 day retreat, stretched out on the sofa under an afghan catching some of the Olympics. I'm looking forward to catching up on the opening ceremonies. Except for a small issue with a rolling bed the first night- a friend gave me rubber cisterns- I slept beautifully. I got out for a good walk one day, went snow shoeing yesterday and kept up with a few exercises on my yoga mat. I wasn't so virtuous with the food though. The meals were great but I definitely partook of a few too many goodies! I put the binding on my fish shack piece from last weeks blog. It is sold and I could sell two more! Today, I walked around taking a few pictures of some other projects on the go. This is just a smattering if everything that got sewn. 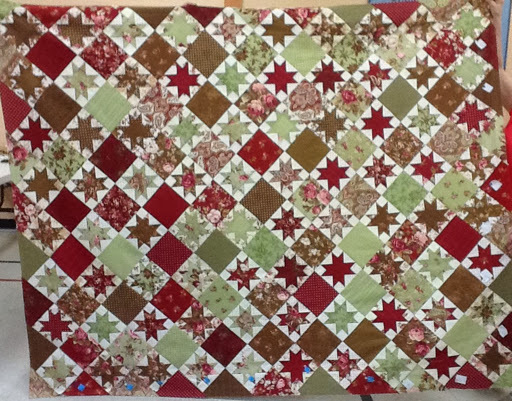 This one is a Christmas quilt by Carmel and boy the blocks were small! I'd never have gotten it finished! This picture cane from the Campbellton group, Linda and Christine. 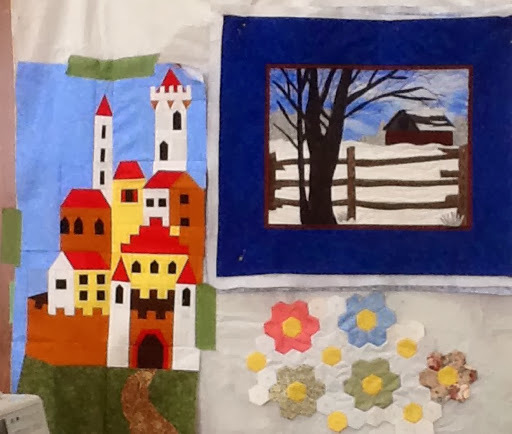 The landscape was a pattern and the castle came from a mystery quilt going on through our guild. A couple more projects on the go today by leonine and Paulette. The photo of the next picture doesn't do it justice. The fabrics were quite striking. 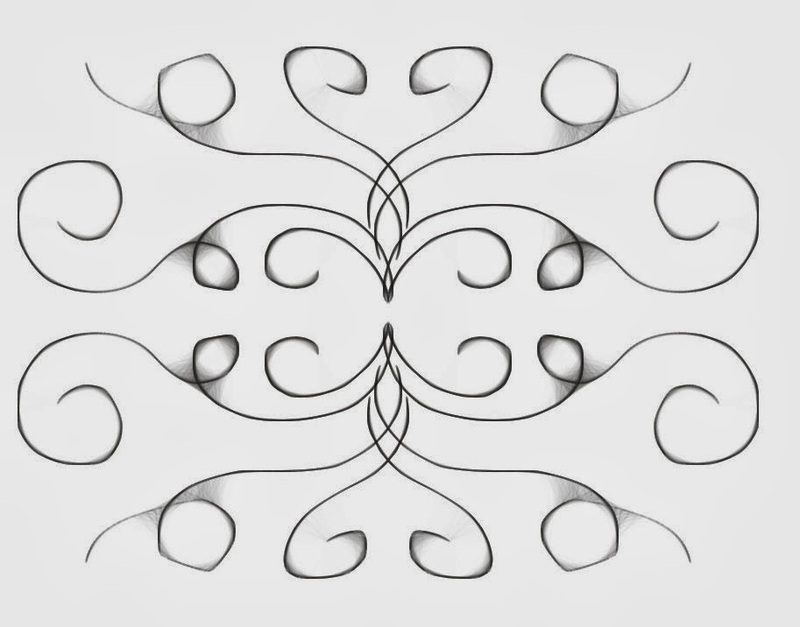 It seemed quite an intricate design to me. I'd never make it through the whole quilt. 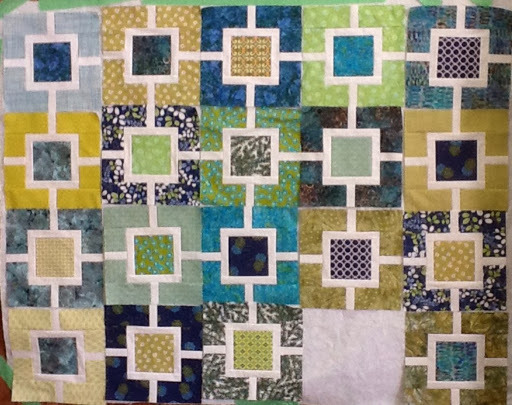 Finally, I got 21 of 30 blocks done for my quilt that will be a wedding gift. 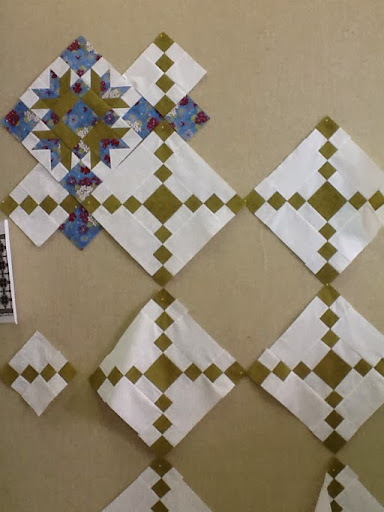 There will be white sashing added between all the blocks. Again the colors haven't shown perfectly with my I Pad. I'll eventually get a better one. I tuck this project away for my UFO days. 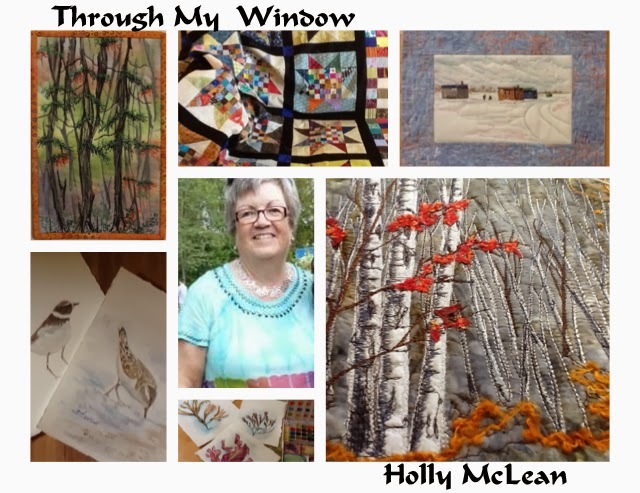 This week, I'll get back to my art quilting. I hope you've all had a lovely weekend. 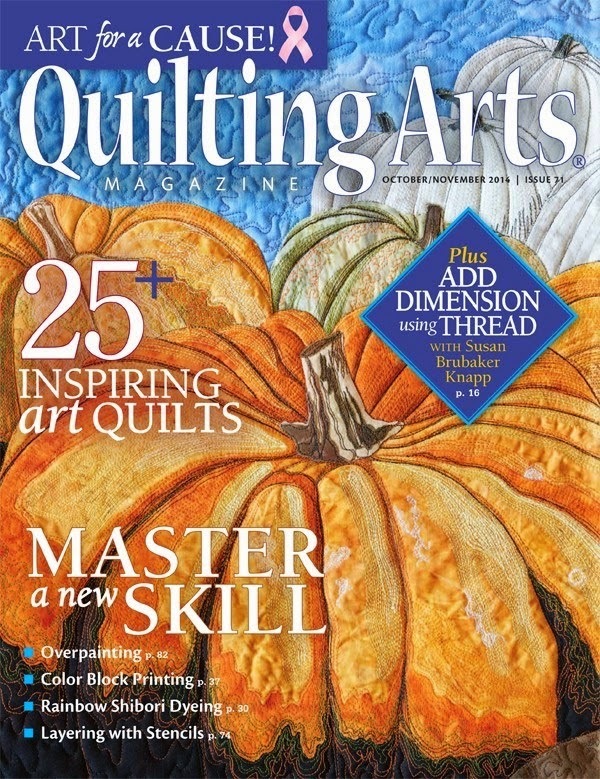 I'm posting a quick blog note to say that I'm heading to quilt retreat on Thursday morning for 3 nights and 4 days. I've been busy packing a few projects. 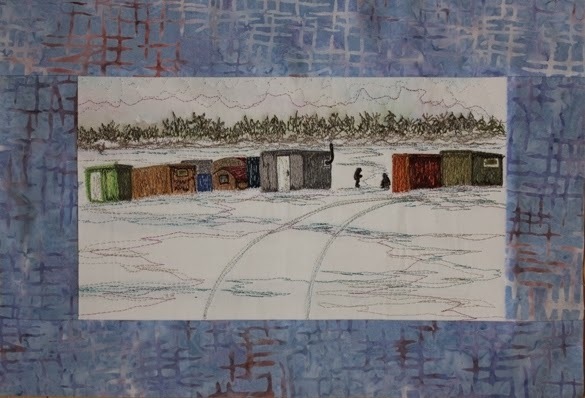 Yesterday, I finished the quilting on the fish shacks. I cut the binding and backing to take with me. On the whole I'm pretty pleased with it although there are a few small changes I would make. 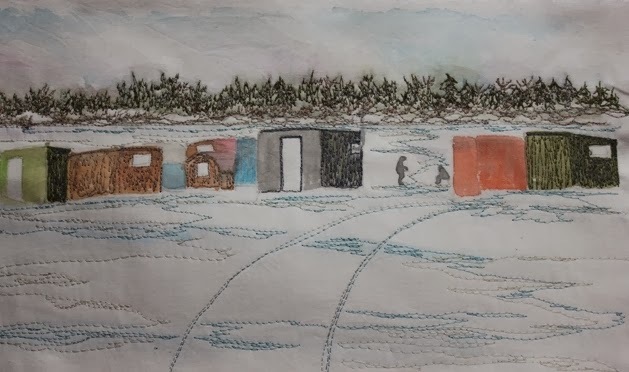 I've been tossing around how best to stitch a piece like this where the foreground ice should really be quite flat but is not due to the batting. Perhaps I should just accept it as part of the medium. On my next piece though I'm going to use more interfacing and maybe a lutradur instead of batting. We'll see how that goes. I'm connecting to The Needle and a thread Network. We woke up to about 6 inches of a light powdery snow this morning, totally a surprise as we hadn't watched or heard the weather yesterday. 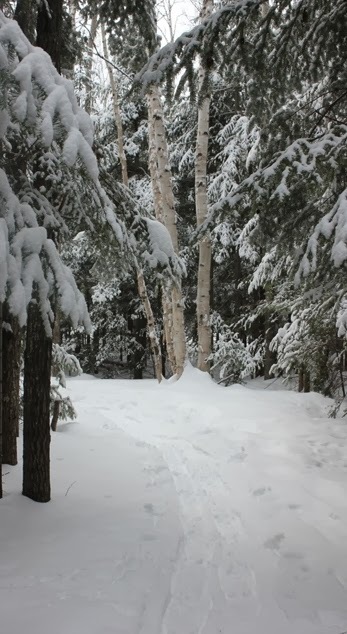 It was so mild and beautiful around lunch time when we went for a snowshoe. To date, it has been so cold when we went that I didn't bother with the camera so I took it along today. This is a trail we have walked many times. I always look for the different little things that catch my eye. I couldn't resist one trail shot; we were the first over this part of the trail. I dubbed these leaves the 'hangers on'. The color against the grey and white is pretty. 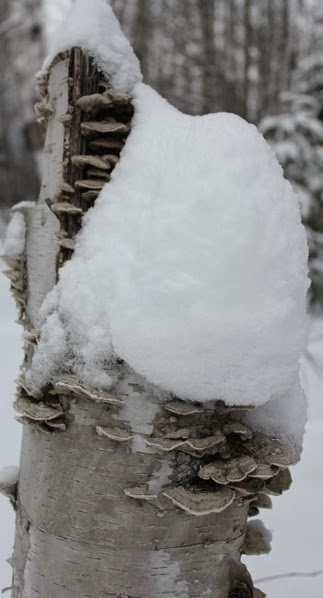 This stump with the snow capped fungi was interesting. After a hot chocolate and a snack, I went into my sewing studio to organize some things for my retreat coming up this week and to do a bit of sewing. 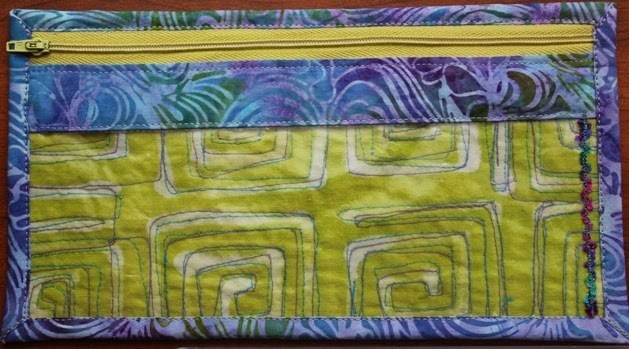 I thought I'd show the finished pouch that I made. Do you often make silly little mistakes? I thought it might be easier to make the facings stay flat if I carefully ran the iron along the edge. It did but I slipped and hit the vinyl which made a little melted spot. I decided to treat it as a happy accident, zigzagging a bit of ribbon trim along the edge. Perfect. I'm looking forward to Downton Abbey to-night!.